Watch bluebird activity in your yard or field by offering them a roost in the Heath Cedar Bluebird House. This home is perfect for beginning birders, creating a convenient and rustic shelter. The roof slopes downward and has a slight overhang, preventing water from running into the 1.5" diameter entrance hole. The cozy interior has rough surfaces, for nestlings to grip the wood easier, and a ventilation slot underneath the lid helps regulate the interior temperature. Unscrew the bottom screw to open the home and check the nest regularly, or to clean the house at the end of the season. The sturdy cedar construction is resistant to water retention and insects, for a clean and rot-proof house for several seasons. Mount this house to a pole or post with a screw through the predrilled hole in the back. 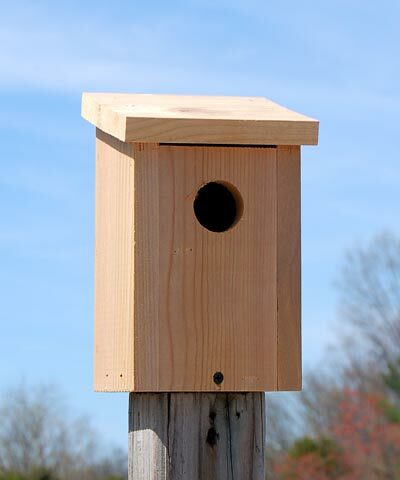 Bring bluebirds to your area with this Cedar Bluebird House. Made in the USA.